If you're craving something crunchy and smokey in between eating loads of meat, this side dish does the trick. 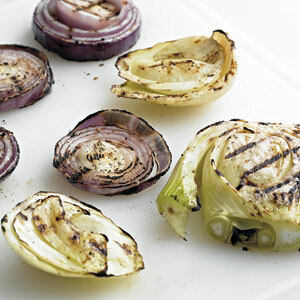 Our Grilled Fennel Salad recipe is super flavorful and easy to make. Brush onion and fennel with olive oil and season with salt and pepper; grill, uncovered, over direct heat until softened, 5 minutes per side. Cut vegetables into slices; toss with vinaigrette. Garnish salad with fennel fronds. Romesco sauce—based on roasted pepper and tomatoes, and thickened with almonds, hazelnuts, or bread—originated in Spain.